Please do not have: your name as a portal-link to a website, website links, or your email address included with your comments, or we will repost your comment with out any links. Also, please post your comment here, versus trying to email us privately, or we will reply by asking you to post here. The Best Thing to Happen to Blairstown in 30 Years: Gourmet Gallery! this year's students at blair academy are about to get an education beyond the usual prerequisite college requirements. they are about to find out what real food tastes like. there is a new game in town and it's called the gourmet gallery. located at 31 main street, a few doors down from the post office, a quick drive by would reveal a rather unassuming little place but oh the food! word travels fast in small towns and the lovely lady at silverlake farms down the road (where i get my produce) told me the sandwiches are so good there are lines outside. but in truth, i first discovered the existence of the place, a mere 15 minutes drive from our weekend home in hope, at the fancy food show in new york beginning of july. i noticed a few ladies at my booth with badges that identified them as coming from blairstown. of course i had to tell them that i am a neighbor. 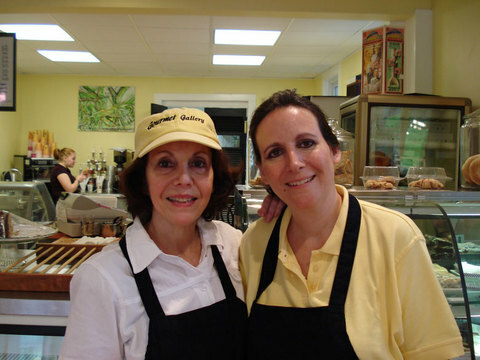 mother and daughter, anita and lori siegel, run the gourmet gallery and do much of the cooking and baking. lori had tried out restaurant work when the café in hope opened about 9 years ago, starting as a cook and baker. i remember noticing how suddenly the desserts were exceptionally good. anita moved to blairstown with the plan to paint full time. but when daughter lori decided to open the take-out restaurant it became a joint effort immediately, putting their heads together with many ideas. the menu offers a wide selection of fresh sandwiches, paninis, and wraps, baked goods, and superb gelato in many flavors. the mango had little pieces of fresh ripe mango and the vanilla version tasted amazingly of my favorite eurovanille and tahitian combined. the menu is constantly changing and it is immediately apparent that only the finest and freshest quality ingredients are used in everything. the coffee of the day was from guatamala and i was astonished to discover that it was the best coffee i've experienced outside of my own home perhaps ever. for lunch i ordered one of the daily specials--the "pulled pork with tangy sauce and special cole slaw." special indeed--i've had pit master's pulled pork and this was the best i've ever tasted complete with crunchy bits from the outside of the barbequed pork. the sauce was perfectly tangy-sweet. it was more than enough to share with my husband. the little side dish i chose, the red bhutanese rice with dried cherries and scallions was inspired. i felt as though i had landed in paradise. cup of gelato in hand, i walked further down the street in the drizzle (what else is new this summer) to introduce myself to herman shoemaker, the owner of the local bookstore "booknest." i was hoping he'd carry at least one of my books to give me an excuse to come back to sign them and for more tastes at the gourmet gallery! i hesitated to write about them as they're crowded enough already! after all, i don't come from new york for the weekend in the country to wait in lines. but i want to do everything in my power to support local excellence. and the siegels tell me that one day they hope to expand into the store next to them. for now they have a nice outdoor space on the other side with tables and umbrellas. gourmet gallery is open tuesdays through saturdays from 9 a.m. to 7 p.m. for lunch and afternoon coffee, specialy teas, and ice cream . if you come, you're likely to see me standing in line! No Barista Can Do It Better! Rose Levy Beranbaum is the best selling, James Beard and IACP award winning, author of 10 cookbooks, mostly on baking. Her ground breaking The Cake Bible was inducted into the International Association of Culinary Professionals Cookbook Hall of Fame, 2016. Rose is also the designer of bakeware and kitchen tool products, including her Synglas non-stick rolling pin. This site includes pages for: over 12 years of blog postings, Rose’s books, 100’s of baking recipes, 150 Rose Levy Beranbaum demonstration videos, answering baking questions, and a Recipe of the Month. The contents of real baking with rose, including recipes, are the exclusive property of Rose Levy Beranbaum, unless otherwise noted. All rights reserved.